The races and places are landmarks in both game and his life and I feel privileged to be a part of it for 108 pages. Ryllia isn't tight, the system isn't novel but it has something more precious: a soul. History informs Ryllia's current state. A creation myth scoops up lush lumps of antiquity to intertwine the fates of races. The loci of this rich history is The Curse. The old immortal races, jealous of the new mortal races (humans), got together to wipe them out. It backfired spectacularly and each old race suffered their own unique drawback, from hoarding to hedonism. These races exist in the modern day at odds with the effects of The Curse; powerful yet broken enough to retain balance. 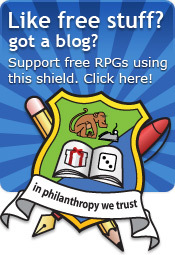 The campaign world is rich and plump; brimming with wild jungles, dark unexplored forests, sunny archaepelagos, towering citadels and scarred mountains. The races are neatly describes and broadly humanoid. My favourite race is the Myrwinn, an intelligent race of flying rats whose culture differs in each nation. 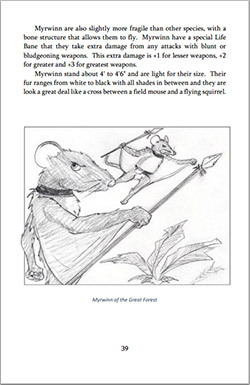 The Myrwinns below are from the Great Forest. Split into world shattering Greater Elements of Wind, Water, Void, Deep and Fire and then the wear-flowers-in-your-hair powers of prayer, songs and hugs in front of a log fire (I made that last one up). You pick an element (called an Aspect) and stick with it. There are no spell lists to pour through but a good set of examples of the kind of things each element can do. Magic has sensible limitations and if you do quite a lot of magic, you're going to pick up quirks. In magic systems such as these, the player's imagination is key and I think Ryllia gives just enough to fire the imagination without snuffing it out by over-specification. Not the title of Tom Cruise's autobiography but character creation. You don't actually create a legend, though; that will happen through the course of play but you do create a budding hero-to-be. The creation steps lead you through nicely, although I think picking race and nation is rather difficult because it requires that everyone reads the entirety of Chapter One. Attributes and skills are point buy with a dash of D6 points too. Your Attributes are Sight (awareness/intelligence), Joy (charisma) and Life (strength/dexterity). Spark adds a player chosen ability, such as "Always makes a dramatic entrance". You can have as many Sparks are you can afford. Mystery is used to generate plot hooks for your character. The more you have of it, the more the referee can pull out of the blue. I am not sure I like this one as an attribute as I think that players should all be given their turn in the spotlight. Professional skills are decide-your-own and combat skills are choose-a-style. Boons and banes are advantages and disadvantages and latch onto an attribute. A player decides a little description and a value (boons and banes must balance). Use these during play when appropriate. Story Points are awarded for making the story more interesting and a Legendary rating charts your progress in the game. The higher your Legendary rating, the more difficult you are to kill. Both Story and Legendary points can be used to save yourself or bend the narrative. Based on skill, attribute, modifiers, a D6 and a target number. Exploding die on a 6 and if your equipment is particularly nasty you can roll more than one D6 and pick the best. Combat has initiative and then you choose how much of a pool of points you assign to offence and defence. When you attack, use the attack number with a D6. When defending, use the defence. There's more but nothing startling here. The background is rife for reimplementing in your own favourite system. No-one will love your campaign world like you will. That accepted, you can move onto making it easier for others to play. 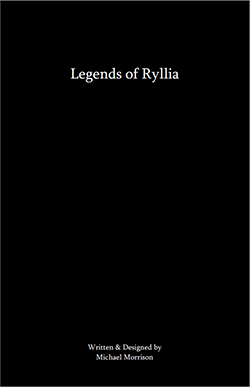 Ryllia is a great campaign world and deserves its bolts tightened to improve its accessibility. I don't know if Michael intends to return to it but hopefully this little list might help others struggling to move from "the brain dump" to a work more easily consumed. Organise your contents. Introduction passages should avoid. Be consistent in your terms. If you have an ancient warrior race called the Gumbys then avoid using "that old Warrior Race". Split up races and locations. The players won't ready all the background before building a character, so write short paragraphs for each nation/race choice. Put all the chatting-to-the-reader in an appendix at the end. If the relative locations of places are important, include a map. Could be a photo of a scribble on a napkin but it makes a big difference. 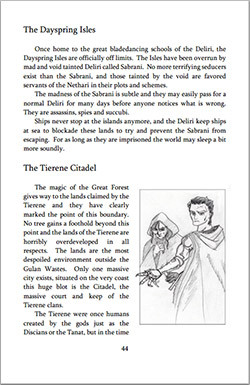 Campaign worlds that turn into games are full of charm and heart. Reading Ryllia stirred something up that peeled out a smile. Reading it is like reading a mirror on the campaign worlds of each and every one of us - personal, loved and inhabited as a time shared with cherished friends. I do hope Michael returns to it, to help it mature rather than leaving it to languish.